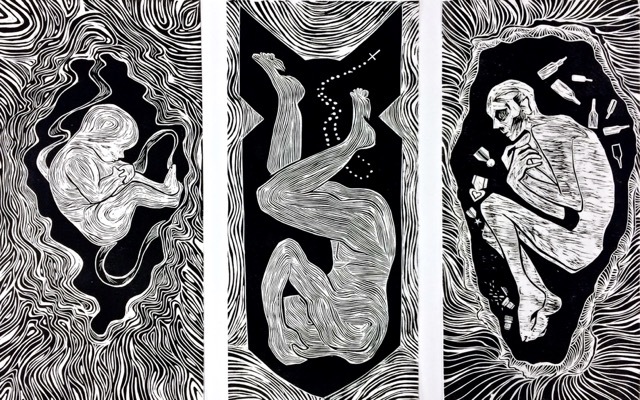 Description: “Welcome my Son, Welcome to the Machine” by is a triptych woodblock relief print inspired transgenerational trauma and PTSD. This piece pays homage to the artists’ great grandfather, father, and every man and woman who have ever experienced and continue to experience trauma during their time served in the military. It’s truly an honor to serve one’s country, but the artist challenges Americans to consider that honor shouldn’t overshadow the pain and atrocities caused by war and continue to affect hundreds and thousands of veterans and their families year after year. Shifting the conversation not only helps those affected by trauma process it better but it sets up the next generation for a possible future without war.